This type of meter was developed in the 1880s and was an alternative to magnetic coil meters. The idea is that we can charge two plates which become attracted to one another when in proximity or direct contact to high voltage. If we place a spring or weight to keep the plates apart by default the forces will work against that to pull the plates together. A great thing about electrostatic meters is that they could be used to effectively measure AC power, you would not have to rectify (convert to DC) the signal like you do if you use at magnetic coil meter. This device measures the actual potential at an object’s surface. Some electrostatic voltmeters have a “butterfly” look and are used to measure hundreds to thousands of volts. Above: This electrostatic meter detects charge and is used in grounding high voltage circuits. This meter was designed by William Stanley in 1896. Today you’ll find electrostatic ground detectors used to make sure fuel tanker trucks are grounded properly so that there will not be a spark that could cause an explosion during loading and unloading the product. AC systems also have to be properly grounded for safety. 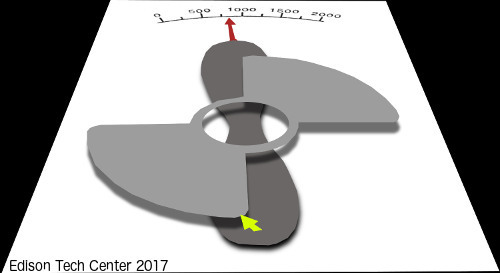 How it works: With the rotational configuration above one of the plates (which is aluminum or carbon) is allowed to rotate and wants to align itself with the other plate. Either the meter sits and uses gravity to zero the needle, or a spring pushes the rotating plate so that is zeroed. A spring system allows the meter to not have to sit vertically. See our video. Electrostatic field meters will measure the electrostatic field at some distance from the meter’s actual sensors. 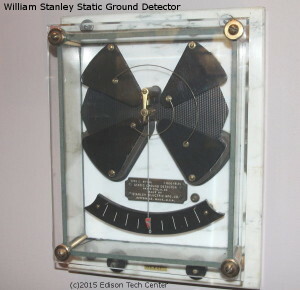 More on electrostatic field meters. In our next page we will talk about how we measure high voltage today using PTs (Potential Transformers) and CTs (Current Transformers). Sources are found on our credits page.